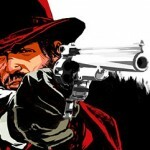 Rockstar’s Red Dead Redemption is set for an April 2010 release for Xbox 360 and PlayStation 3. Redemption is Rockstar’s followup to Red Dead Revolver and promises a dusty Western filled with guns, mustaches, and horses. Personally, I could do with more games featuring mustaches and horses, so I’m pretty excited for Red Dead Redemption. Since Rockstar’s latest open world game, Grand Theft Auto IV, has great storytelling and character development, there’s a great chance that Red Dead Redemption will feature well-crafted gunslingers shooting people for believable reasons. This doesn’t mean that I don’t enjoy shooting people in video games for absolutely no reason; I don’t want you guys to get the wrong impression. With the release date announcement, Rockstar revealed that a new trailer for Red Dead Redemption will hit the Internet next Tuesday. “Red Dead Redemption is a Western epic, set at the turn of the 20th century when the lawless and chaotic badlands began to give way to the expanding reach of government and the spread of the Industrial Age. The story of former outlaw, John Marston, Red Dead Redemption takes players on a great adventure across the American frontier. I hear ya, freebieconsoles. I usually like things better when they have a Western theme. I guess the one exception to that would be Back to the Future 3. I can’t wait for this game. I had a lot of fun with Gun, with Rockstar behind this with their production values i’m hoping it fills in the Western genre gap. Unfortunately I didn’t get round to playing the first so not sure what to expect.